Love these recipes? PIN THEM to your DINNER BOARD to save them! Crisp and salty on the outside with fluffy baked potato inside, these Roasted Fingerling Potatoes are a great way to change up the average weeknight meal. Fingerlings are much quicker to prep and roast than baked potatoes or oven fries; there is virtually no work involved. No slicing or dicing the potatoes, just wash, drizzle with oil, sprinkle generously with salt and toss them in the oven. While they are roasting, whip together the sauce and you will have a side dish that people will still be talking about the next day. My kids and I liked these potatoes so much the first time we made them, we ate the whole batch while they were still hot off the tray. I didn’t even bother with the rest of the lunch I had planned. My older son and I love the Chipotle Garlic Dipping Sauce. (I can not get enough of this stuff; I’ve been putting it on almost everything lately!) 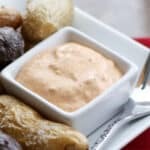 If you aren’t a fan of spicy heat, I recommend you try Po’dunk Sauce or Ranch Dip; they are both delicious with roasted potatoes and my younger boys love them. 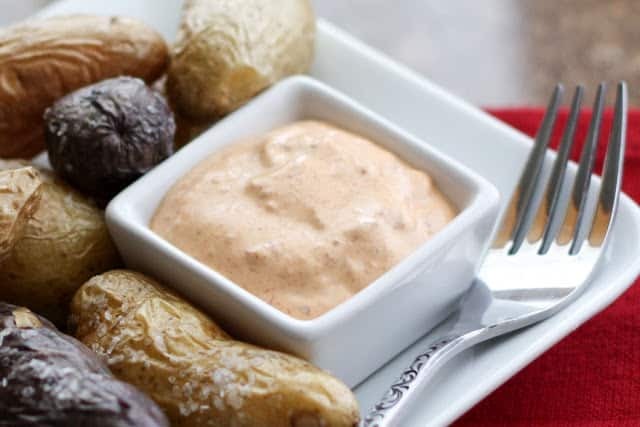 I’ve been making the Chipotle Garlic Dipping Sauce dipping sauce along with every possible variation of roasted potatoes for a few years now and I still love it every bit as much as I did the first time I tasted it. I roasted a couple pounds of fingerling potatoes with our lunch earlier this week and decided this recipe needed a boost from the archives. It’s just too tasty to be forgotten! Preheat the oven to 400 degrees. Place the potatoes on a large baking sheet and prick holes in each one with a fork. Drizzle them with oil and then use your hands to coat them thoroughly. Sprinkle the potatoes with salt. Roast the potatoes until they are fork tender, about 25 minutes. 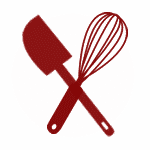 While the potatoes are cooking, combine all the sauce ingredients in a blender or small food processor. Puree until smooth and creamy. Transfer to an airtight container and chill until ready to serve. Enjoy! I love roasted fingerlings also and can't ever resist buying a box of them when I see them at the store! This chipotle garlic sauce truly does sound like the perfect dip for just about anything dippable! Fingerlings are just made for dipping! LOVE that plate and dipping bowl, perfect for the plating of this dish. 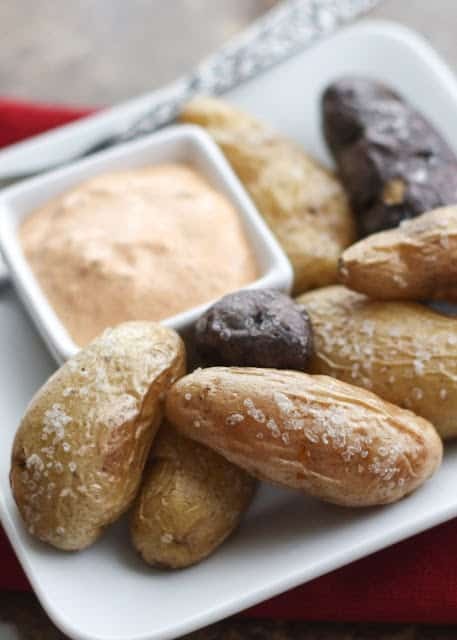 Clever idea to serve little roasted potatoes with dipping sauce and you made them look very appealing. The dipping sauce sounds delicious. I bet that dipping sauce will make another appearance soon. It sounds too good not to share on other delicious recipes - such as vegetables, tacos, chicken, fish - goodness it sounds great! Yum! I bet the sauce would also be good with my deep fried Walla Walla onion rings when they come in....just counting the days to harvest!